In September 1923, Brigadier General Mitchell provided a chilling view of the effectiveness of aerial bombardment on surface vessels to skeptical government and military observers. Taking off from his temporary Hatteras Village airfield, Mitchell rendezvoused with Martin Bombers from Langley Field, Virginia. Equipped with newly developed bombsights and supercharged engines, the bombers quickly sank the obsolete battleships "Virginia" and "New Jersey" anchored just 20 miles off the Hatteras Island coast. Responding to General Mitchell's urgent call for construction of a temporary airfield, local Hatterasmen used shovels, hoes, and horsedrawn carts alongside a tractor pulling a weighted pallet, to fill holes, tidal pools, and marshy areas and pack level a landing strip. Their quick work helped to ensure the success of Mitchell's demonstration. 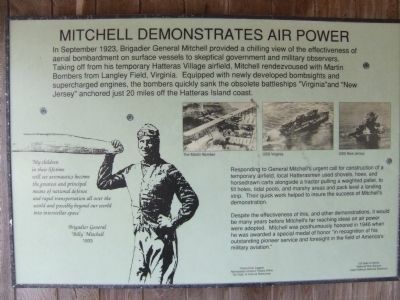 Despite the effectiveness of this, and other demonstrations, it would be many years before Mitchell's far-reaching ideas on air power were adopted. Mitchell was posthumously honored in 1946 when he was awarded a special medal of honor "in recognition of his outstanding pioneer service and foresight in the field of America's military aviation." Erected by Frisco Civic League. Northeastern Historic Places Office, NC Dept of Cultural Resources. US Dept of Interior, National Park Service, Cape Hatteras National Seashore. Location. 35° 13.917′ N, 75° 37.348′ W. Marker is near Frisco, North Carolina, in Dare County. Marker is on Billy Mitchell Road 0.2 miles east of North Carolina Highway 12, on the right when traveling east. Touch for map. The marker is located on the porch of the small building at the Billy Mitchell Airport. Marker is at or near this postal address: 53252 Billy Mitchell Rd., Frisco NC 27936, United States of America. Touch for directions. Other nearby markers. At least 8 other markers are within 6 miles of this marker, measured as the crow flies. America's 1st Attempt at Civil War Reunification (approx. 3.9 miles away); Confederate Forts (approx. 4.8 miles away); Flagship USS Minnesota/Hotel de Afrique (approx. 5 miles away); Maritime Casualties of the American Civil War/Loss of the USS Monitor (approx. 5 miles away); Burnside's Expedition Crossing Hatteras Bar/The Burnside Expedition at Hatteras Inlet (approx. 5 miles away); Fort Clark/The Bombardment of Fort Hatteras (approx. 5 miles away); Paukenschlag (approx. 5.2 miles away); Life at the Light (approx. 5.4 miles away). More. Search the internet for Mitchell Demonstrates Air Power. Credits. This page was last revised on June 16, 2016. This page originally submitted on June 28, 2009, by Charles O. Frazier of Williamsburg, Virginia. This page has been viewed 865 times since then and 13 times this year. Photo 1. submitted on June 28, 2009, by Charles O. Frazier of Williamsburg, Virginia. • Kevin W. was the editor who published this page.